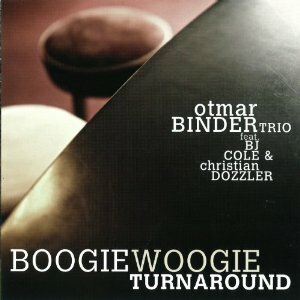 Pianist Otmar Binder is joined by Alexander Lackner (Bass) and Michael Strasser (Drums) to form the Otmar Binder Trio. Together with BJ Cole (Pedal Steel) and multi-instrumentalist Christian Dozzler, they have recorded this album - Boogie Woogie Turnaround. As the name suggests, the music is Boogie-Woogie, a form of music that was very popular back in the 1940s but which is rarely heard these days. Essentially boodie-woogie is a piano based form of blues music. Fans of Jools Holland will probably be familiar with the style as he is one of the few well known musicians still playing this form of music. It's rare these days that you hear something completely different - there are lots of rock bands, heavy metal bands, singer songwriters and so on, but there is usually at least one other artist who sounds similar to any given artist. In the case of this album then there really isnt much to compare it to, other than perhaps Jools Holland. For me this is what makes the album so enjoyable - it's something different to what we're all used to hearing on a daily basis. It's a purely instrumental album, with the piano being the dominant sound, but with the guitar, percussion, bass and strings being used to complement the piano and enrich the sound the drums in particular help drive the tunes along. This is the sort of album you can happily have playing while you read a book or do some work - it's not overpowering so won't distract too much, but it's really pleasant background music. If you're looking for something a bit different then this is definitely worth a listen.